Low speed long range professional digital radio. Aprisa is the new, point-to-point digital radio solution developed specifically for a wide range of narrowband applications where a high performance, flexible architecture is required. Utility Networks - The flexible interfacing ability of Aprisa makes it the logical low-capacity building block for utility communication infrastructures. Interfaces can be analogue and/or data/Ethernet to support both legacy and next generation network equipment. The flexibility to re-assign bandwidth as the network evolves ensures Aprisa will maintain its currency as a radio solution well into the future. Rural Networks - Aprisa makes best use of high performance RF technology to cover long distances in rural/last-mile telephony applications. Forward Error Correction (FEC) delivers exceptional data integrity for robust and reliable transmission. Special attention has been paid to limiting power consumption for solar powered and standby subscriber applications. Mobile Networks - Cellular and TMR/PMR networks often require low capacity base station sites for permanent or temporary use. By using the embedded cross-connect, Aprisa can easily drop and insert a number of channels to the remote site, quickly and cost effectively. Enhanced Performance - The embedded micro cross-connect switch promotes efficiency by distributing capacity to the interfaces in steps of 8 kbps. Voice interfaces operate at 64 or 32 kbps per circuit. Ethernet, data and fractional E1 interface capacities can be configured depending on the Application. A typical 128 kbps bearer might be used to provide two 32 kbps voice circuits and 64 kbps for an Ethernet link. Class 3 ETSI compliant QAM modulation delivers spectrum efficiency essential in today's congested radio environments. Aprisa uses advanced digital filters to provide optimum protection against adjacent channel interference. PC based set up software simplifies the configuration and management of Aprisa. 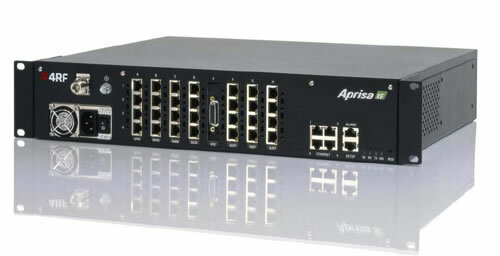 Third party network management platforms can monitor Aprisa via the SNMP interface.